I took this picture down Haven Beach earlier this year. Old House Woods is infamous for its ghost stories which are generally rooted in the notion that at some point pirates buried a treasure somewhere in the vicinity and then perished at sea. Some claim to have seen ships sailing through the air; others have seen pirates, skeletons, people digging for treasure or horses and cows that disappear into thin air. Why can't my dirty laundry disappear into thin air? The land my parents and I now live on was once a cemetery, part of which was a slave cemetery, or so we’ve been told. We have never seen any marked graves, but we have found chunks of stone and cement when we’d go digging around the fields, and I confess I was always hoping to find something substantial--like some bones or a casket. It was the young archaeologist in me. Or the freak. Take your pick. One Christmas Eve, Middle Sister and I got up in the middle of the night (or rather, very early in the morning before sunrise) to see what awaited us under the Christmas tree. It was very dark and, not wanting to startle our parents, our grandmother (who was living with us at the time) or Baby Sister—all of whom were sleeping—we turned on just the lights of the tree. Very quietly we investigated what had been left for us. All of a sudden, I got this really eerie sensation, the one where you feel like somebody’s watching you. Middle Sister and I, simultaneously and without saying a word, glanced in the direction of the doorway. There, standing in the dark, we saw someone in a white gown. There was no head, no feet, no arms or hands, just the gown suspended in mid air. As quickly as it came, it disappeared. There were no footsteps. I have successfully blocked out whatever happened next. (I find this is a helpful survival mechanism, particularly in this family of mine.) Perhaps Middle Sister can fill in the blanks. I know we both froze still as statues, and I think I asked her, whispering, whether she saw what I saw. Yep, she sure did. Later that morning we asked everyone else in the house whether they’d come into the den earlier. All of them replied they had not. There was no history of anyone sleepwalking either. Middle Sister and I had been quiet as church mice. We didn’t wake anybody up because their bedrooms were at the opposite end of the house. We maintain to this very day that what we saw was supernatural. We believe we saw a ghost. I've seen many things I can't explain: fiddler crabs in my yard; ants on my countertops even in late October; laundry piles that never end; a praying mantis in my kitchen sink. But this particular episode takes the cake. This is Snapshot Number: When Is She Ever Gonna Post Something Besides the Same Sunset? (also known as #359) of a sunset off Gwynn's Island from earlier this summer. I may or may not have posted it before; actually, more than likely I posted a sister shot of it where the sun was centered. I like this one because it doesn't focus so much on the sun. It balances that ball of fire on the right with the nothingness in the middle and the greenery (which appears to be blackery thanks to my lack of flash) on the left. Sometimes I find it more interesting to look at things differently than from what is expected. Other times I find it liberating to toss non-words such as "blackery" around with confidence and abandon. (d) My kids posted my picture all up and down the county with a note that says, "Wanted: Someone Who Can At Least Pretend to be a Mother. Apply in person at Chesapeake Bay Woman's house, but bloggers need not apply. We've had it with blogging. And working, but she does have to make a living at something." When I left Mathews for college, I was fortunate enough to have a roommate from Finland, although she'd lived in the U.S. most of her life. My other roommate, let's call her Iris just for shucks, and I would notice that every now and then Ms. Finland would say things that were almost right, but just wrong enough to be hilarious. To make matters worse (or better, depending on your perspective, and mine definitely says "better"), Iris's mother was from Greece, and she, too, struggled with certain aspects of the English language. So Iris and I were inundated with strange renditions of the usual idioms or words. 5. You could kill two stones with one bird (as opposed to two birds with one stone). If any of you have similar Mixed-Up-isms, please leave a comment so I'll have something to laugh at later tonight other than the mound of dirty laundry taking over my bedroom. Did I say I was going to be brief? The only thing brief here is any hope of a reader's attention span. This is a picture of a farm in Dixie which is on Route 3 headed towards the Piankatank River. Please note this is distinct from The Dixie most people are familiar with. Dixie in Mathews has only a fraction of the people and way better places to buy eggs. For anyone unfamiliar with our terrain, the brown stalks in the foreground are part of a recently harvested corn field. The corn is typically used for feed. My grandmother used to buy her eggs from this place in Dixie. As kids we'd go with her to purchase them, and Have Mercy did that chicken place stink. That sort of smell should have nothing to do with something one is purchasing to eat and should have everything to do with something one is looking to bury. It was fun for us, though, since they let us come right into the chicken coop (pen? yard? house? What is this thing called? Anyone?) to look at the chickens. They seemed to be loving life, although one time a few of the chickens pulled me aside and said they could really use some Febreeze and a few Glade Plug-Ins, vanilla scent, please. The Dixie Chickens* did (and do) produce very nice, fresh eggs even if you must carry smelling salts on your person at all times in order to purchase them. *Not to be confused with any singing group, the Mathews Dixie Chickens were popular and famous only for their eggs. And their smell. This is another picture I took over near Deltaville last week. Is it just me or does that building appear to be slanting a bit? I already know the answer to that rhetorical question. "Today when I woke up it was raining. When we got to school it was snowing. Theresa and I tried to make a snowman, but the boys kept on recking (sic) our balls. John threw a snowball at me, hit me in the leg and it STUNG! We went in and our shoes were soaking wet! After school we went to the dentist and we have to use a special floride (sic) toothpaste. I only had 1 cavity. I don't have any homework. Let's tally the score, shall we? I'd say that was a pretty crappy day myself. Middle Sister called it a fair day. She has a much higher tolerance for crappy than I do. Or perhaps, she's just a tad more optimistic. Or, maybe she was so used to being tortured by me by that point that even getting pounded with a snowball and having a cavity after a trip to the dentist sounded like a walk in the park. I took this picture back in August when I traveled down New Point way to take pictures of the lighthouse. This was in the vicinity of the dreaded fiddler-crab attack, where the crabs actually came up out of their natural habitat into the road to get me. Speaking of New Point, I have a little bit of trivia to share about the lighthouse. Our local paper, published once a week, is the Gazette Journal. One of my favorite columns, Glimpses into the Past, contains tidbits and snippets of newspaper articles from the past, sometimes as far back as 100 years. For example, in the "80 years ago" section, you might read about a certain Mr. John Doe who was quite upset when his cows broke through a section of fence and wandered all over the place. Or in the "40 years ago" section, you might see where Murphy's Mart was setting up shop in Gloucester. "...Five hundred and twenty-eight bushels of oyster shells were spread to and around New Point Comfort Lighthouse on Saturday to provide safe footing on the rocky island. A barge lent by Jerry I. of Grimstead was loaded with oyster shells and towed from Davis Creek by Morris S.
Warner W., Anthony W., Robert S., J.C.J., and Anthony B., all students at Mathews High School, provided the manpower for moving the shells." 4. Chesapeake Bay Woman is old enough that she recognizes names in the Glimpses from the Past section of the paper. 5. Chesapeake Bay Woman will now begin scouting out nursing homes for herself. 6. Right after she makes the appointment with the hairdresser to cover her gray hairs. This is an old barn and a soybean field in Deltaville, in neighboring Middlesex County. The fields of green soybeans from earlier this summer are now mostly yellow or brown, when they're ready to be harvested. The barn looks like it's seen better days but as I always say, beauty can be found in imperfection. Speaking of imperfection (for example, a mangled finger or a bizarre family), below is the last part of my mother's story, continued from yesterday. Part III of Chesapeake Bay Mother's Story, picking up after she caught her finger in a mixer and had to interrupt her father-in-law's shower in order to get emergency help. You know, the usual stuff that happens every day in households across America. Is it any wonder that the kitchen has the essence of a bungee jump for me? Even my mother, with all her kitchen temperament, would probably have agreed. The hair on my neck still stands up when I hear the sound of a mixer. **"
* I wonder how much of that shock could be attributed to the earlier sight of her father-in-law in the shower vs. the trauma to the hand. We may never know. ** The hair on my neck still stands up when I see my mother's finger, which to this day is mangled, particularly near what used to be the fingernail. The hair on my neck also stands up for the following reasons: dirty laundry, clean laundry that hasn't been put away, clean laundry that gets put back in the dirty laundry by children, ants, fiddler crabs, sinking boats, dirt, clutter, trash, junk, unidentifiable plastic parts that children insist cannot be thrown away, weed-filled flower beds, an icebox that hasn't been cleaned out since the Roosevelt era, litter boxes and cat hair. The End. This was shot on Gwynn's Island. I don't know why, but I just loved the combo of the tree, the swing, its shadow and the incredible sunset lighting up that building. Speaking of swinging, let's shift gears now and hear more from Chesapeake Bay Mother. Part Two of my mother's story about kitchen mishaps now continues. "I've had many injuries in the kitchen, which is a combat zone to me and has its own belligerent attitude which must be countered (no pun intended). Here's the thing: I was 7 months pregnant with Middle Child** at the time. What should I do? Run screaming upstairs where father-in-law is showering, summon him forth dripping-naked*** to render aid? If I hadn't been in such a nightmare-ish , grotesque situation, I might have laughed, which father-in-law would have appreciated. As it was, I focused on the problem at hand (literally). He recovered composure and threw something on and we went very fast to the doctor. **And here we have The Start of Middle Sister's feelings of always being the victim. She may very well have a valid point. ***And guess what: There's another story where my my mother was pregnant with Littlest Sis that involves lack of clothes and an emergency encounter between my paternal grandfather and Chesapeake Bay Mother. Remind me to tell you, because otherwise the story goes right back into the vault where I keep all my dysfunctional memories. This vault is the size of Fort Knox. This is a picture I took this week off Gwynn's Island of sponges that had washed ashore. I say sponges and yet I have no idea if that's the technical term, although usually I am very technical, detailed and accurate in my descriptions of things. Speaking of sponges, regardless of whether the shot above depicts them or not, that reminds me of the kitchen. My kitchen really needs one right about now. Along with someone to actually put it to good use. The following is from Chesapeake Bay Mother, about her own mother, my favorite grandmother, Nanny. Nanny lived in a teeny tiny house in Gloucester that had everything a person could ever want or need with two exceptions: cabinet space and patience. "When I was young, we didn't have an alarm clock. Yes, they'd been invented. My mother had too many pots and never enough cabinet space in the kitchen. So just before breakfast time there would be an avalanche* of clanking metal, punctuated by expletives, out of distinct hearing range--but undoubtedly unfit for young ears--issued by Mother in angry terms. That sound always did the trick, along with the rushing sound of birds' wings flushing way from the presence of evil in our kitchen. This was especially welcome on non-school days** when I probably would have slept past seven or eight o'clock. She was as reliable as Big Ben and Old Faithful, combined with a pinch of Haley's Comet. * Chesapeake Bay Children spent many nights with dear Nanny and can absolutely attest to the fact that pots and pans plus expletives meant No More Sleep for anyone. In the state of Virginia. **Yep, even if it was a weekend when her grandchildren were trying to rest up. If she was up fighting the pots and pans, she was not going to do it alone. *** That's because she does the same thing. Do NOT open a cabinet over there, don't open the icebox, don't open anything or look at anyone cross-eyed, or the aforementioned launching of the following sequence will occur: pots and pans clanking + expletives = Let's get outta here. I'm too tired to write anything right now (paying job is getting their money's worth), so I'll let this sign talk to you briefly about Mathews. The sign will not omit details, forget, mix things up, and most importantly will not contain run-on sentences where run-on is defined as "containing sleep-inducing, hypnotic effects." However, in response to that, I'd argue that the sign has it pretty easy. No kids, no stressful job, no drama, no ant infestations (yes, I still have ants, even when the frost is on the pumpkin and the Raid is on the counter) and no laundry. Stay tuned for more pictures and background on Mathews Courthouse. At some point. In the future. Unless I decide to do something else. Which is highly likely. In the meantime, I'm still waiting on Middle Sister to comment on yesterday's story. She's probably playing tennis. I've been brushing up on ping-pong myself, which is close enough to tennis in my book, or rather it's as close to tennis as I'll ever get. Here’s another reminder that fall is here and winter is around the corner. Speaking of around the corner, just to the left of where I was standing when I took this picture is the scene of one of the most thrilling and dangerous moments of my life in Mathews. In fact, it was almost my death in Mathews. My father collected many toys over the years, and one day he decided we needed an airboat. Airboats are essentially flat-bottomed vessels propelled in a forward direction by an aircraft-type propeller and powered by either an aircraft or automotive engine. The engine and propeller are enclosed in a protective metal cage that prevents objects, e.g., tree limbs, branches, clothing, beverage containers, or wildlife from coming in contact with the whirling propeller, which could cause devastating damage to the vessel and traumatic injury to the operator and passengers. The propeller produces a rearward column of air that propels the airboat forward. Steering is accomplished by forced air passing across vertical rudders. There must be a forceful airflow in order for the vessel to be steered. Airboats do not have brakes and are incapable of traveling in reverse. Stopping and reversing direction are dependent upon good operator/pilot/driver skills. 1. I’ve never EVER seen one around here. 2. That’s because they’re death traps. They were built first to deafen, then terrify and ultimately kill people, especially children. 3. They do not operate predictably in deep water. Or at all. Middle Sister and I decided to take the new contraption for a spin, and naturally I had to drive. My father provided detailed instructions on safe and proper operation. These instructions were as follows: “Here ya go! Have fun!” Then he walked off and took a nap. There were no adults to be found in a 50-mile radius. All I remember is a very brief spin up the creek in deep water (no good for airboats) against the wind (no good for airboats) and deafening noise directly behind us (no good for eardrums). None of this was good for Chesapeake Bay Children. The noisy helicopter blades swirled right behind us, and if either one of us had decided to stick a finger in there, we’d have been flung to Jupiter. Tired of fighting the wind, and deafened by the noise even with earplugs, I turned the boat back around and high-tailed it home. Determined to see how fast the boat would go, I floored it. The wind was behind us giving way too much of an extra push, and we were over deep water, which equated to unpredictable steering. Particularly for an unskilled operator. The next thing I knew we were headed directly towards the shore, wide open, helicopter blades whirling and Middle Sister screaming. (I couldn’t hear her shrieks over the deafening sounds of the death blades.) I was trying to steer us away from shore but it just wasn’t working. We were headed straight for land. What happened next can best be explained by Middle Sister. The boat ended up perfectly cushioned in a bed of marsh grass, helicopter blades still swirling. Two stunned children disembarked, pulled out their earplugs, laughed nervously and agreed never to speak of the incident again. I took this picture in my back yard last week. I was trying to capture the leaves that are ever so slightly turning, and the water. Around here, we have green leaves one day, then we have a day or two of color, then we get a nor'easter and the leaves are blown entirely off. The End. The colors of fall don't last long at all. I took a class called Cinema as an Art Form in college. Middle Sister and I went to the same college, and she convinced me to take this class as an elective for what ought to have been a very easy A. All we had to do was watch a movie each week and analyze it to death. This was right up my scholarly alley. Just like interpreting art or poetry or a story or a book or a situation or a Whatever, interpreting a movie is really very subjective. As long as you can brainstorm a few good ideas and understand the subtlety of what goes on in the background (color, symbolism, etc), you earned your A in the class. Middle Sis didn't get her Easy A because she and I are wired differently (where differently is she's a genius who is very literal, and I just make stuff up, spew it forth and call it a day). I hardly even attended all the movies and I still got the Easy A because I can look at or read something and interpret it a million different ways. Please don't ask me to make a decision, though. Or do anything else, especially if it is something productive. There are endless ways I'd interpret this photo above. I encourage you to add to the list below. I love other perspectives and it's also a good creative exercise for the brain. These days, that's the only exercise I'm gettin'. 1. Take a view through the telescope of nature. The weeds below and the tree branches above form a circle which serves as the lens to view the water. 2. In the midst of what seems ordinary (leaves, water, grass), there may be beauty that others do not see until it is pointed out. Your day-to-day life may seem boring, but if you stop to really look and appreciate what is around you, it's anything but ordinary. Beauty can be found everywhere. 3. It represents the circle of life and the unity of all living things. 4. It's a bold statement, and that statement is this: Chesapeake Bay Woman hasn't mowed her shoreline with the push mower at all this grass-cutting season, which lasts forever around here. The shoreline weeds have grown so high she couldn't cut a path through there with a back-hoe. This is Callis Wharf on Gwynn's Island. It's been a seafood center for over 100 years and was a major stop for the steamboats that traveled up and down the bay. I always dreamed about winning the lottery and turning this wharf into a combination convenience store for boaters (gas, bait, ice, beverages, food,whatever) and a really nice restaurant that would be upstairs overlooking the water. I'd reserve the best part of the place for the folks in the seafood industry to preserve the reason the wharf even exists. There might be a small section or outbuilding that could be rented to tourists or to locals who just want to get away from the normal drudgery of life. (A quick night away would be very affordable). I dream about this, however I would never want the responsibility of actually having to run it. I just can't commit to all the work it would entail. This is very similar to my approach to housework. I can see the potential for clutter-free living, I envision how much better it would be if I could just be disciplined enough to do a little bit each day. But I am unable to do it. I am, however, quite capable of that internet thing. Hello, my name is Chesapeake Bay Woman and I spend entirely too much time on the internet. I am not ready to admit how many hours I spend here, but if you care to share how much time you spend, perhaps I'll 'fess up. I took this picture of our creek at sunrise about a week ago. With the weather changing, we tend to get some fog in the mornings - you can just barely see here a bit of mist rolling off the water. It bears repeating that I do not do anything special to my pictures because I do not know how. This is just what comes out when I press the button on the auto setting. The color here is exactly how it was that morning. Orange, pink, red. Amazing. My grandmother on my father's side was an avid walker. She ate like a bird and walked every single day. She was known around here for delivering papers-and community updates-to the neighbors as part of her early morning walks. "Some people think the sunset is one of the most beautiful sights on the earth. But CBW's Paternal Grandmother revels in the sunrise. 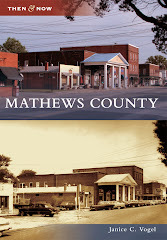 Paternal Grandmother (PG) has a newspaper route in Mathews County. She arises at 5:30 every morning in every sort of weather to deliver the Times-Dispatch and the Daily Press to about 20 homes on or near her country lane....."
PG is a tall and slim woman with terrific posture and she believes in walking. She first started walking regularly as exercise when President Kennedy advocated it. 'Soon I learned I had to have a reason for doing all this walking, so I decided to take on a route.'..." "....I don't consider delivering papers a chore, but a privilege to see everything that is so beautiful in the morning. I love nature. I see things that nobody else sees. There's always something different. I would recommend walking to everybody, but I know they wouldn't take me up on it. I was talking to a couple just the other day who said everything is arranged in their home so they never have to go outside. Well, to me, this is living like a mole...."
My paternal grandmother died 7 years after this was written, but she kept up her daily walk just about to the bitter end. I remember I had a basketball game the day she died, and the coach told me I could sit out if I wasn't up to playing. I played, because sitting idly on the bench and not being a part of the action didn't seem right and isn't what she would have wanted. Walking is the easiest exercise you can do, if you are physically able to. Although I've fallen out of the habit, I intend to return immediately, especially after reading my grandmother's words from over 30 years ago. Is it possible to walk and be in front of a computer simultaneously? I'm having a devil of a time prying myself away from this chair. Aside from the couple of main roads in Mathews County, most other roads (side or back roads) look exactly like this. You could stand right on the yellow line and not see or hear a car for 15 minutes (or days) or longer, depending on where you are. One day I stopped my car in the middle of the road and stood there taking pictures. In this case, it only took approximately 3.25 minutes before I heard a car approaching from behind. Actually, what I really heard was the beating of my heart as I struggled to put away my camera, leap into my car, put the car in gear, miss the correct gear, rev the engine in neutral, and sweat bullets while the car came closer and closer to my car which I've said was stopped in the middle of the road. I uttered a few select words, screamed, cried, mopped my brow, took a deep breath and finally started moving just before the vehicle got close enough to realize there was Some Lady standing in the middle of the road, in the middle of nowhere, taking pictures. And just what was I taking pictures of? The answer depends on your perspective and how long you've lived--or not--in a place like this. 1. This is a photo of the sun glistening through the last green leaves of summer. The trees gracefully define the bend in the road, and the bend in the road represents the change in seasons from summer to fall. Fall is just around the corner. 2. This picture represents Man vs. Nature: We civilized creatures carve and pave roads through nature, but nature finds a way to shine through and co-exist. 3. This picture proves how ridiculous it is for a grown woman to stand in the middle of a road, stare at the trees and take picture after picture when in fact she's right in the middle of a two-lane road--on a corner no less--where a car could come right up on her at any moment. 4. Someone should call the law when a picture like this is taken. 5. This is a picture of nothing. The End. There are many possible descriptions or interpretations. If you have any to add to the list, feel free. My vote is a combination of #1 and #5 above. But next time, I'm pulling off on the shoulder to play this game. I took this picture several weeks ago from Gwynn's Island. If I had my way, I'd park myself on this side of the island every single evening just to get a picture of the sunset. Each sunset, just like each sunrise, day, and moment in life, is distinct and unique; no two are ever the same, and each one is a gift. Grandma J. tagged me the other day. She's a famous celebrity comedian and movie critic in Texas who takes vacations for 5 weeks at a time, cruises Alaska, dines in swanky restaurants in California, excels in aqua aerobics, and juggles at least 4 boyfriends. If I ever have a technical question such as, "How do I turn off my computer?" she's my Go To Person - she's very technically savvy. She also makes me laugh every single day, except the days when she's on the Alaska cruise and can only post when she's in port. 1. I rode an elephant at the state fair once. That was when I started thinking I wanted to be in the circus. Little did I know that I'd be living with the circus every day of my life when I grew up, but that's a story for another day. 2. My sister and I saw a ghost one night. Seriously. She can back me up on this one. I’m saving the complete story for Halloween. 3. I once narrated a training film that nobody outside of a very specific/select group of people will ever see. The producer said I could have a second career in narration if I wanted. I told him I didn’t know I had a first career. What is it? I’d really like to know. 7. One time I caught my hair on fire and another time I almost stepped on a copperhead snake. Both disasters were avoided by running faster than Carl Lewis. The wind created by my sprinting put out the flames in my hair; and the snake didn't have a chance to sharpen his fangs before I was in the next county, even though he was right next to my feet, where "right next to" = close enough to my foot to have doubled as a shoe. That's all, folks. Tell me something random and/or weird about yourself, other than the fact you've read this to the bitter, merciful end. Earlier in the summer, I took this picture of the shoreline from the public landing. The public landing is on public land for use by the public of Mathews, of which I am a member. That dock is not public, but I was definitely not trespassing, just my camera lens. If they want to arrest my camera, I'll have to get ugly and fight them tooth and nail. I realize I mentioned the word "tooth" above, but I promise I'm not going to talk anymore about dentists, teeth, anxiety and fear. Well, I promise to never talk about teeth again. Today I'll finally respond to a meme sent to me by Rob at inukshukadventure. Please take a peak over there and check out the great photos. Did you know Canada's Thanksgiving was earlier this week? Head on over and read all about it. 4. The Internet Police, who say if they charged me a penny for every hour I spent on-line, we could bail out Wall Street and send $100 to every family in the United States to jump-start the economy. 4.The now-defunct Payne's Frosty Freeze (currently Lynne's) in Mathews. I am going to have to write an entire post on this topic, it is so deserving. The cheeseburgers were out of this world, and please don't get me started on the ice cream cones. 3. Perusing paperwork from my paying job that says, "Go ahead, Chesapeake Bay Woman, retire early and don't ever worry about working again. We'll pay you to sit home and blog. And nap. Actually we already pay you to nap here at work, so that will be nothing new." 4. Jon and Kate Plus 8. I have no real explanation for that last one, but I am spellbound every time I watch that show. I think it’s because I am so unorganized and often feel so inadequate with only two children, and this woman handles twins and sextuplets. She makes every single perfectly organic meal they eat. Her house is perfectly uncluttered. She’s not an alcoholic. She hasn’t killed her husband. I just don’t get it. Grandma J. has also tagged me for a meme (or a moomoo as she calls it). I'll try and get the answers up tomorrow or the next day. In Chesapeake Bay Woman-speak, tomorrow or the next day = sometime in the near future, where near future may = Calendar Year 2008, but you shouldn't trust that with a ten-foot pole. This is a picture of a building right next to the high school. It's been vacant for a long time. Most Mathews residents will remember it as the place with the railroad crossing signs out in front of it, even though there is no such thing as a railroad in Mathews. (I always loved the whimsy in that.) Someone told me the owner once worked for the railroad, and that he ran a saw or scissor sharpening shop here years ago. Yesterday or the day before, they tore this old beauty down. The entrails of the building are still smoldering. It makes me sad to see these structures disappear forever. To any Mathews--or Gloucester--readers still awake, if you have any stories or contributions about this particular building, please leave a comment. This is a picture I took from the Eastern Shore of the bay this summer. This sunset and many like it calmed me down; we were on a camping trip and it was anything but relaxing. Today I start taking pills to ease my anxiety about oral surgery I'll be enduring tomorrow. I will also try and load up a few posts so that in the event of (a) my death or (b) the dentist's death which could mean (c) my incarceration for attacking Mr. Oral Surgeon/Dentist, there will at least be a few new things tossed up here. In the event of (a), (b) or (c) above, I, Chesapeake Bay Woman, do hereby bequeath this blog to tj of humbleorigins. She and I used to comment together on the Pioneer Woman's site and she'd always make me laugh. Then I'd make her laugh. Then she kept telling me to start a blog. I kept saying I couldn't. She kept saying do it. I kept saying no. She kept saying yes. You can see who won, even though I don't usually surrender so easily. Are you asleep yet? Because I am just about there myself, and I haven't even started taking the pre-operation sedatives yet. They may not even be necessary, I'm quite sure I can lull myself into some comatose state reading my own blog. You're probably saying to yourself, "Boring. This is a very boring picture." Ordinarily I'd agree with you, but this is more than just a picture of a ladder leading from the water to the dock. This is a picture of Chesapeake Bay Woman. Can't see me? I'm just barely under the surface of the water but I'm pulling myself up. On top of it all, this week I am having surgery to remove a tooth and I am not looking forward to that. In fact, I'd rather be tied, bound and thrown into a swamp full of killer fiddler crabs than see that surgeon. I have to go today to fill my prescription for sedatives to take in advance of that happy event. My point is (believe it or not, I do indeed have one) this will be another week of non-typical events and I will be more out of synch than usual. Now that I think about it, maybe I'll just stay underwater for a while. At least the dentist can't find me there. Church Hill Plantation is located on Route 14 directly across from what used to be Gloucester County Day School, now Ware Academy, where I attended grade school. One time our class went on a field trip to Church Hill, clear across the road. It wasn't much of a trip, per se, distance-wise, but it was a field trip I'll never forget. Even at that young age I was fascinated with old houses, and here was an opportunity to go inside one without violating any trespassing laws. For as long as I can remember and well beyond that since my memory only dates back two days, Gloucester's Church Hill Plantation, which dates to pre-1700's, has been associated with a ghost story. Legend has it that a young girl, pining away for a lost love, fell ill one winter and died. She was buried on the grounds of the family estate. That evening was a cold, snowy, blustery night. A thief rumored to be a disgruntled servant dug the coffin up and stole the jewelry she'd been buried with. Unable to get one of the rings off her finger, he cut the finger off. Imagine his amazement when the shock of his action caused the girl to awaken from whatever coma she was in. The thief ran off into the night. The girl, weak and bleeding, dragged her way in the snow storm to the front door. She scratched and knocked to the best of her ability, but to no avail. The wind was howling, and whatever noise she made was attributed to the storm by people inside. She eventually succumbed to the elements and they found her dead on the front door step the next morning. They (whoever "they" are) say that sometimes rustling skirts are heard in the house. Some say they have seen blood stains in the first snow of winter or on the door where she was knocking. Others say that the most beautiful violets sprout up where she died. I have no idea if any of this is true, if parts of it are true, or if none of it is true, but I do know this: Church Hill is one gorgeous old house with lots of stories associated with it. And every time I drive by I want to pull in and look around for blood stains and violets. Except that would be trespassing. I take many pictures of the same subject often because, as with sunsets, things change by the second. If I have already posted this picture, it hasn't been for some time, so let's pretend it's a new one. I love pretending. Sometimes I pretend I'm a neat, organized person who makes efficient use of her time and lives and works in a clutter-free environment. Then I start to laugh hysterically. Then I cry. I promised few words for Thursday and a ghost story on Friday, since I'm out of town (and assuming I loaded it up correctly. I give this a 40-60 shot). So I'll wrap this thing up quickly. On Saturday, there will be so few words that there won't even be a new post! Same for Sunday. Have a great week and may your days and nights be as peaceful as this sunset. There is something about gazing at water that calms and relaxes me. I need something to calm me down right about now; between work and kids and athletic schedules and unscheduled life events, and some insect buzzing within the woodwork of my kitchen window which I am in denial about (because surely I do not have a carpenter bee infestation), and the house looking like Hooraw's nest, I am just plain worn out. I've had a very unusual past few days and find myself more stressed out than usual. The effects of this stress can be seen everywhere I go. For example, this morning I had to get gas on my way to work, and while I did not drive off with the gas nozzle in the car,which I have done before, I did pull clear up to the gas station, parked alongside the mini-mart portion rather than the gas-pumping section, went into the store, purchased an iced tea and just about drove off before I remembered that I did not come there for iced tea, in fact I came there for gas. All I need to do is focus on this picture and my blood pressure drops several points which is a good thing because otherwise I'd be dialing 911 to report my very own stroke. Is it a full moon or something? I've always been very sensitive to the full moon. I blame it and hormones for practically everything in my life, mostly the bad things. I have to go away for a few days but am loading up some pictures that OUGHT to post automatically while I'm gone. If they don't post, then I'll just have a stroke when I return. Because naturally I will not have access to the internet, the story of my life, to see whether or not they post. Tomorrow I'll slap up a picture and a few meaningless words, but Friday --if it loads properly--there will be a ghost story that you won't want to miss. Or that you will miss if I haven't loaded it properly. Have a great rest of the week, everyone. By the year 2008, it became nigh on impossible to distinguish between the livestock on display, and the humans being herded through food mazes and ride lines as if they were livestock. 1. Never--EVER--go on a Saturday. The End. 2. Never go on the last Saturday of the fair. 3. If you do either of the above, expect to share your visit with every overfed, overstimulated, over-sugarfied, over-fructosecornified family or family-like cluster who do not get out much (present company included) from the states of Virginia, West Virginia, Kentucky, Alabama, every other state in the continental U.S., plus several representatives from Europe,who stand out because they're the ones laughing and pointing at all of us natives shoveling deep-fried cookies down our throats while others are placing bets on how long it will be before the chest pains begin. 4. The proper adult to child ratio or ideal span of control should be 1:1 or at least 1:2. I was handling three children in a crowd which outnumbered the population of Hong Kong. No good. After way too much time spent eating and riding death traps also known as rides, I convinced the group to see the animals. Approximately 2 hours later, after walking a distance equivalent to the length of the Appalachian Trail (with 3 children in tow), we finally found the barn area. When I came up on these ducklings, I wanted to get right up there with them and slide head first down that slide. While searching for other animal exhibits, we walked through a tent where they were showing cattle. We were right dab-smack in the middle of the whole event, and there were killer cows everywhere. These killer cows were being showed by children who could not have been more than 12 years old. We high-tailed it out of there, because cows can sense fear and weakness, and I was emitting enough "I'm petrified" hormone to create a stampede. Finally, I found someone I could relate to. This individual had an attitude about being at the state fair and was sick and tired of being subjected to loud noises, people, crowds of people and throngs of people in close confinement and 90-degree weather. *A zonkey is a cross between a zebra and a donkey, although the term may also be used to describe Chesapeake Bay Woman in the hours after lunch, especially between 2 and 4, at the paying job also known as work. Virginia’s State Fair has been a yearly ritual since 1854, when a group of people decided to create a permanent location for the fair which they envisioned as a place for family fun, commerce and education. Farmers as well as the general public could learn about agriculture, manufacturing, and the latest trends in technology. Over the years, the state fair has evolved as times have changed. They have an astonishingly simple methodology to achieve these goals: force feed you with food that will kill you and then shake you up on the rides until you can no longer draw a breath. The first step is to ensure the dazed and confused masses consume inordinate and lethal quantities of hydrogenated oils, high fructose corn syrup, saturated fats, sugar, red dye #2, MSG, nitrites, nitrates, and sodium. When you enter the gates of the State Fair, you have to walk through about 5,000 food booths. They will not give you a map until you wade your way through the maze of temptation. Some of the items for sale include: elephant ears, funnel cakes, popcorn, kettle corn, turkey legs, BBQ, ice cream floats, ice cream sundaes, cotton candy, candy apples, bucket o' fries, bucket o' death, corn dogs, hot dogs, fried fish, fried Oreos, Italian sausage, Polish sausage, New Guinea sausage, fried oysters, fried shrimp, fried green beans, fried dill pickles, fried fingernails, fried applesauce and fried cole slaw. I’m pretty sure you could get deep-fried bacon fat if you wanted, although that one had a warning label from the Surgeon General. Once you are loaded to the gills with disgustingly unhealthy food that tastes like a slice of deep-fried heaven, the next step is to shake you up a bit. At the State Fair every single ride involves spinning. Some involve spinning to the point where you’re flung upside a wall. Others spin you, fling you, hang you upside down, and spit on you. Then they have the nerve to laugh at you. This death trap is called the Zipper. It spins you around and around while another part of the trap is spinning around and around. They call it the Zipper because when you get off, you’ll wish they were zipping you up in a body bag. Based on my experience, I’d say the State Fair is very successful at accomplishing its mission. There are a few more photos and stories to come this week as soon as my eyes come uncrossed and I finish my fried food detoxification program and my cardiac rehabilitation. This is a picture of Chesapeake Bay Family after a fun-filled day at the Virginia State Fair. This is a picture of Chesapeake Bay Family after a day of cruel and highly unusual punishment, along with episodes of torture, claustrophobia, paranoia, shock, disbelief, incredulity, horror, mental anguish and physical exhaustion. More details to follow this week, assuming I'm not admitted to Eastern State Hospital before I get around to writing about it. You can be the judge as to which version above is more accurate after you are presented with the facts and supporting evidence. I took this picture from the dock at the Sea Breeze on Gwynn's Island yesterday. As usual, people were staring at me. People going into the restaurant stared. Two men launching their boat stared. Another person honked the horn at me all the way from the highway. It was not the sort of horn honk that says, "Hey, Chesapeake Bay Woman, I know you. You know me. How are you this fine afternoon?" No, it was the sort of horn honk that says, "Hey, you don't know me, but I know your kind. Anyone taking pictures at the Sea Breeze must be a tourist or from Richmond or both; therefore I do not know you and I want to mess with you a little bit." I know this because I am fluent in horn speak. It's a gift. Or a curse called paranoia. Folks, Friday I had planned on cutting grass, cleaning the house, doing laundry, paying bills, studying the backs of my eyelids and excavating the vicinity of what used to be my bedroom closet, which now requires a a case of dynamite, a front loader and a demolition permit to access. I interrupt this thought to say this about that: Every single activity I just mentioned sounds and feels like nails on a chalkboard. I'd almost rather spend the day in the hospital than do all these arduous, meaningless chores. Oh wait! I did spend the entire day in the hospital! Not just one hospital, but two. Without going into the details, I have a friend who scared the living daylights out of us all but who has pulled through OK thanks in no small part to a miracle, plain and simple. I see this as a clear signal that I should never try to tackle what used to be my closet ever again. It's just plain bad luck. To help my poor hospitalized friend I really should not do anymore chores. See how that works? See how I can justify a strike against housework? Feel free to borrow my tactic anytime. Just tell 'em the master of avoidance and the queen of denial, Chesapeake Bay Woman, says anything else will bring bad luck and hospital visits. Nope, not yet. Of course not. Please push in the clutch and shift into another gear now. Today Chesapeake Bay Son, Daughter and Daughter's Friend are going to the Virginia State Fair in Richmond. Well, that's our plan anyway. The kids are looking forward to the rides. I am looking forward to the 1,000-pound pumpkin, the blue-ribbon pies, the chickens, rabbits and pigs, with whom I feel a natural bond. They don't much care for housework either. I am bringing my camera so I will be able to share all the magic. And naturally because we'll be gone all day long, I won't have time to risk any bad luck by attempting all that housework I didn't do yesterday; my Saturday is pretty well shot. Sunday is a day of rest, no? Monday I have to go to the paying job. Looks like I won't be accomplishing any of that housework any time soon. These are some very lucky seagulls who frolic around the Sea Breeze on Gwynn's Island. Now that I think of it, I'm not exactly sure seagulls frolic, but if they could, these would, they're just that happy to be here. By the way, the pole is crooked in this picture, not the position of my camera. Just look at the shoreline if you don't believe me--and I wouldn't blame you one bit if you didn't. In the early 1900's, my great-grandfather was a blacksmith at Flat Iron, which is on the way to Ware Neck in neighboring Gloucester County. He lived to be well into his 90's, and he spent most of his older years with my grandmother. I had the privilege of seeing him whenever I would stay with her. Tall, lanky and strong as an ox due to years of pounding that anvil, he unfortunately became a little senile as he grew older. For example, he often thought Union Soldiers were invading, and he was particularly concerned that they were setting up a blockade. He referenced this blockade so often I have to wonder if he didn't actually come up on a Union blockade at some point in his life. He was just that obsessed with it. Eventually, he became too much for my grandmother to handle, and he went to live in a local nursing home. Sometimes he recognized his visitors, but most of the time he didn't. Not only was he losing some of his mental faculties, he was hard of hearing and struggled to see. One day a clown came by to cheer up the nursing home residents. She was a happy soul who did her level best to bring a smile to a lonely person's face. When she came to my great-granddaddy's room, she stood in the doorway and attempted to engage him in some banter, but he wanted absolutely no part of it. Much like a small child, he was terribly frightened instead of being entertained. Determined to overcome this intruder--who may or may not have been a Union soldier putting up a blockade in his doorway--he started hollering. When that didn't work , the Confederate Blacksmith used the only weapon he had to save himself: the box of Kleenex on his nightstand. He carefully extracted a tissue and threw one at her. The tissue had as much potential for damage as it did flight; it landed right next to where he released it. She tried to reassure him and took a step closer. Undeterred from his mission, he took another tissue and threw that one at her. She didn't budge. He threw each and every one of those tissues until they were all gone. Then, he did what any enterprising soldier would do in the heat of battle after running out of ammunition. He improvised. In a last-ditch effort to save the Confederacy, he threw the empty cardboard tissue box square at Miss Clown, who finally surrendered and left his room. Above is a picture of our creek. Seemingly unrelated, below is a picture of our daffodil field that I took back in March. I know five people who are celebrating birthdays today, one of whom is my Baby Sister. You know, the one with the saucy comments who likes to put chewing gum and lipstick on my cups and glasses. She no longer lives in Mathews, although we've been trying to entice her back here. She probably doesn't want to come back because she's afraid I will torture her with the battery-operated train that had a functioning headlight and an engineer whose head bobbled back and forth. I would turn that thing on and watch her run in absolute, sheer, utter terror. I laughed and laughed. I confess I am ashamed of myself for treating her that way, and I admit it was a horrible thing to do. But I sure had fun doing it. When she was younger, Baby Sister's picture was in the local paper. She was picking daffodils with our grandfather, the daffodil farmer. It's one of my favorite pictures of her and him. Baby Sis, for your birthday I give you a picture of the creek, and a picture of the daffodils. Both beckon you to return. And while I do still have that train, I promise I won't put any batteries in it. Speaking of grandfathers and festive occasions, tomorrow I'm going to relay a short story about our great-grandfather, the blacksmith. Happy Birthday Baby Sister and to my other friends celebrating birthdays today. I took these pictures of the Gwynn's Island bridge a while ago. In the upper shot I was waiting for the bridge to open and decided to use my time wisely, because that's what I always do, use my time wisely, where "wisely" equals "about as wisely as a three-toed sloth." Also, I rarely waste time, where "rarely" is defined as "almost always, daily or in everything I do." The Gwynn's Island Bridge was built in 1939. In 1885 a cable ferry--which had to be manually pulled--operated between the island and the mainland. I have no idea what they did before 1885, but I'm sure it was no picnic. Speaking of no picnic, I'd like to talk about how difficult it is sometimes to take these pictures I toss up here. "Sometimes" may be defined as "practically every time I've ever taken one of these pictures." Do you know how many times I've had people stare at me like I'm some kind of freak when I take pictures for this blog? Plenty, that's how many. People just don't get it when they see me snapping pictures of a bridge that's opening, particularly if those people are parked behind me waiting for the bridge to open too. They wonder why in the world anyone would want pictures of a bridge. I know, because I can see it on their face. They never take their eyes off me because they think I'm up to no good. They think I'm taking pictures for a lawsuit or to put all over the internet. I am definitely not taking pictures for a lawsuit, for Pete's sake. There are hazards involved with taking these pictures too. For example, today I went back down to the public landing to check on the soybean fields I photographed a few weeks ago. I was studying the field (while driving, please do not try this at home), and noticed a field full of goldenrod. Well, OK. I have no idea if it was goldenrod or not. But for the purposes of this post, we're going to call it goldenrod. I stopped the car and decided I needed to cross over a ditch to get a better shot. I left the car running, nervously checked to see if any cars were coming, and leapt across the ditch. Right into an old, rusty barbed-wire (or, as some folks say, bob wire) fence that I didn't see because it is probably three hundred years old and blends right in with the pine needles, which are also rust colored. Next, after plenty of high-steppin,' kickin', hissin' and spittin,' (with just a splash of cussin') I went straight into a briar patch. I did get the darn pictures, but I was none too pleased, and you'll probably never be able to see if it was goldenrod or not because the pictures were not that good. Last but not least, today I decided to try snapping pictures while driving. Kids? Do not try this at home. Adults? Do not try this at home. Chesapeake Bay Woman? Don't ever try this again. I've already gone over the whole trespassing issue in previous posts. That pretty much is a given for any picture I put up here that doesn't come from my own yard, which means that 98% of the shots have involved some trespassing. Or not, depending on who is reading this. I conclude by saying that I am willing to do whatever it takes to get a picture, where "whatever it takes" sometimes involves enduring scoffs, danger and hazards. And maybe--just maybe, depending on who is reading this--a hint of trespassing. Or not.